The Handbell Musicians of America Mission: The Handbell Musicians of America is dedicated to advancing the musical art of handbell/handchime ringing through education, community, and communication. 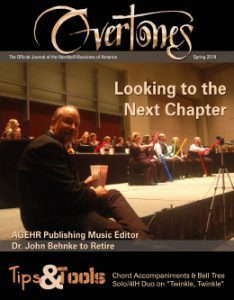 The AGEHR Grant Fund (formerly AGEHR Endowment Fund): Handbell Musicians of America supports the use of handbells in traditional ways and settings. It also promotes the development of new styles, uses, and circumstances. The primary purpose of Handbell Musicians of America is to educate handbell directors and ringers, and to help them realize their full musical potential. The AGEHR Grant Fund is the organization’s charitable branch. Its funds are distributed to qualifying applicants to encourage and support creative projects. 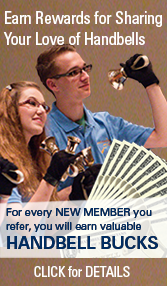 Grants are made to individuals, organizations, and Guild subgroups for projects that support the mission of Handbell Musicians of America. Please note that AGEHR Grant does not award funding for attendance for traditional conferences/seminars/workshops. (Please contact the Guild office about one of our scholarship funds for this purpose.) In addition, applicants should apply for support in one or more of the following program areas. Research and Education: The project must promote research or education of new handbell/handchime technique or styles. The research must be scientifically defensible and sufficiently developed to be eligible for publication. Handbells for the Musically Underserved: The project must benefit and/or support an organization(s) without access to handbells/handchimes. Eligibility may include a musically underserved population not part of a formal ongoing music program. Formal Education: The project must promote and stimulate the use of handbells/handchimes in formal education. To be eligible, the instruments must be used in appropriate classes and may be used as a performance instrument. Handbells for Special Groups: The project must promote and stimulate the use of handbells/handchimes with special groups. To be eligible the program must be supervised by a qualified music teacher/therapist and involve a musically underserved population.